TRAX is a complete solution for Transformer and Substation Testing. With high-performance software and an intuitive app-based interface, Megger have selected the best from our range of power testing equipment, added unmatched functionality and packed it all into one easy-to-transport box. TRAX is changing the transformer testing landscape, helping you to look deeper, and so predict issues with your most valuable assets earlier. TRAX takes little time to learn. 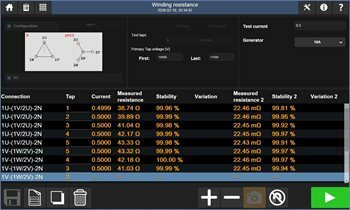 Different apps for each instrument make it simple to perform specific tests and measurements such as winding resistance, turns ratio, and impedance measurements. It’s incredibly easy to use, with an app-driven interface that provides the appropriate connection diagrams, and only displays the necessary functionality for the particular test at hand. There is also the Manual Control option, which allows users to test using a set of custom-defined measurements. For full transformer health analysis, all test results can be unified into one comprehensive report that can be exported to any asset management system. Contact our transformer testing experts for a demo, or request a brochure by submitting the below form.